Our Folding Chipboard Boxes are stated as L x W x D as see in the above illustration. 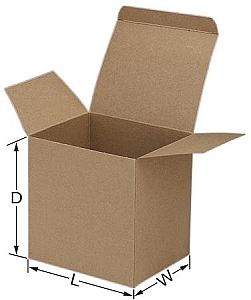 The Length of a chipboard carton is always the dimension going from left to right, the width is front to back and the depth is top to bottom. We have listed our Reverse Tuck boxes in order of the LENGTHS. We hope this listing will be easier for you to find the Folding Chipboard Carton size you need. If not, please call us. If you do not see the size you need, please email [email protected] with the specifications and we'll get a quote back to you as quickly as possible. Our minimum for custom folding cartons is 3500 to 5000 depending on the size needed.